When you cook, you sometimes make mistakes. I cook a lot, and I make a lot of mistakes. It’s how I learn. Those cute little refrigerator magnets say it succinctly : Always Make New Mistakes. Take the evolution of this summer cocktail, for instance. My original idea, based on cherries being in season and a bounty of oregano in the garden, was a Salty Cherry Oregano Cocktail. It was pretty, but tasted like cough syrup. The next version, Salty Cherry Basil Cocktail, was served at a dinner party, and after a couple sips, the guests left their beverages untouched. The consensus was too salty, weirdly medicinal and, well, off somehow. My friend Kate offered that this cocktail might be better off with mint and lime. Brilliant! A cherry mojito. Yes, it has been done before (nothing is really original), but I will put my personal stamp on this refreshing summer beverage with a mint simple syrup which keeps for weeks in the fridge and can be used to invigorate iced tea and lemonade when you are done making cocktails. 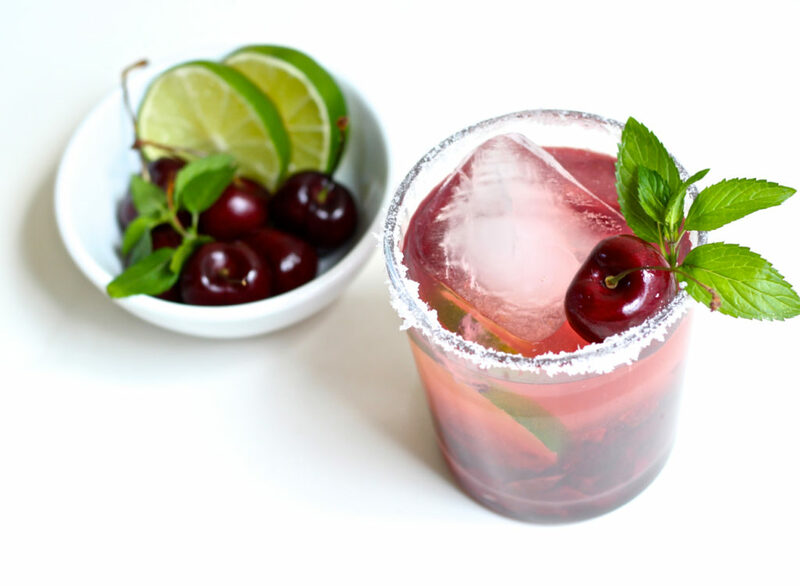 You can also make a Salty Cherry Mojito by rubbing the glass rim with a cut lime and rolling the rim in kosher salt. Salty Cherry Mojito made by rubbing the glass rim with cut lime and rolling in kosher salt. If you are avoiding alcohol, this can be made by eliminating the white rum and adding another tablespoon of fresh lime juice and another ounce of mint simple syrup. My favorite thing about this beverage? The chopped sweet cherries at the bottom of the glass. Stay cool with this summer beverage and for more summer drinks, try cucumber mint cocktail, strawberry cilantro cocktail and coconut basil lemonade. mint simple syrup – bring one cup sugar and one cup water to simmer, stirring to dissolve sugar, and simmer for one minute; add one cup loosely packed mint leaves and chill at least several hours or overnight. Strain (use mint leaves in your iced tea) and keep refrigerated for up to 2 months. 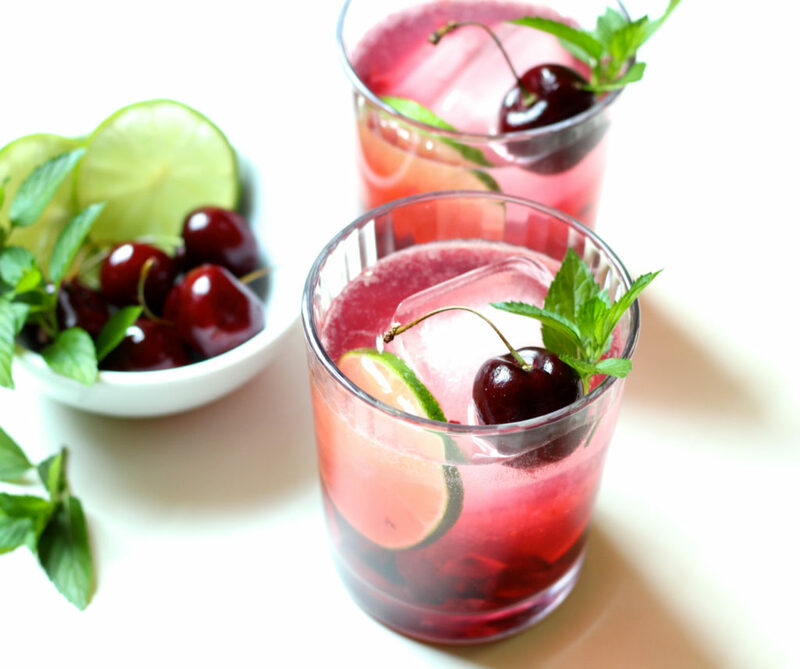 In 10 ounce glass, stir together cherries, rum, mint syrup and lime juice. Add lime slice and fill glass with ice cubes. 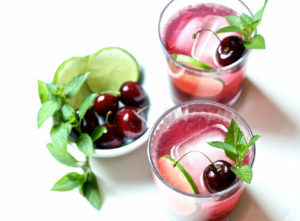 Top off beverage with club soda or seltzer and garnish with cherry and mint. To make nonalcoholic beverage, use 2 tablespoons lime juice and add another ounce mint simple syrup and eliminate white rum. To make Salty Cherry Mojito, rub glass rim with cut lime and roll rim in kosher salt before mixing cocktail. 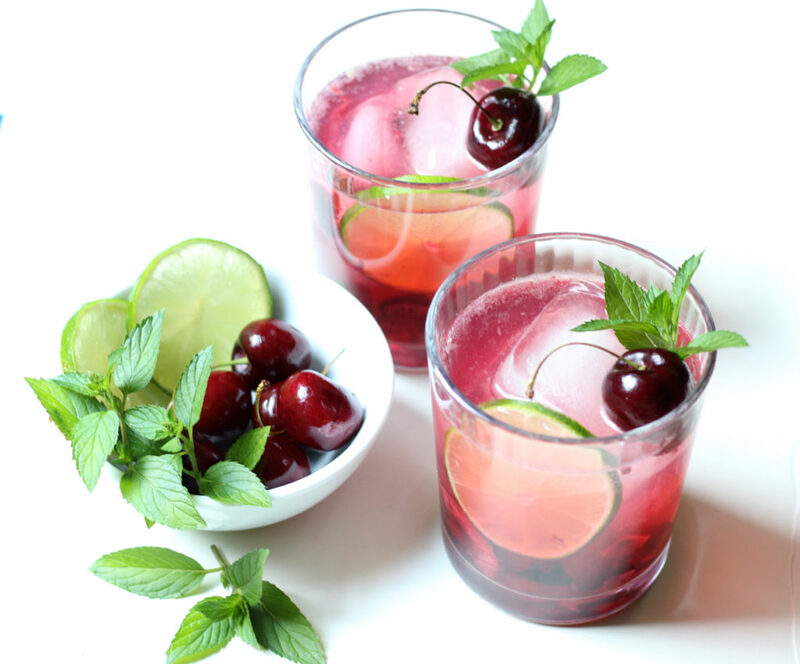 This entry was posted in beverages, cocktails, condiments, gluten free, summer, vegan, vegetarian and tagged cherry cocktails, cherry mojito recipes, cocktail recipes, mint simple syrup, mojito recipes, simple syrup, summer cocktails on July 29, 2016 by Michele Humlan. I am a firm believer in satisfying important cravings, Marla! Well I sure want one of these!!! Then you are a person of good taste!